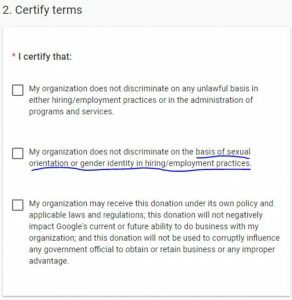 One thing that stops many churches from applying for the Google Ad Grant that comes with $120,000 in free advertising per year is the second item on the list of terms that must be accepted in order to file for the grant. It is unfortunate, because the ad grants are made for 501(c)(3)s and churches especially can get some really good use out of the program and reach a lot of people. Whether people are moving into your town and need a church, or you want to draw people into your church activities and minister to them that way, that $10k a month can go an extremely long way. As a man that is deeply involved in a Southern Baptist church, I completely understand the immediate objections to this requirement. However, hear me out and learn why I believe the majority of churches can and should truthfully check that box. At the end, if you still believe you cannot check that box, that is between you and God and I do not fault you for it. My recommendation in that circumstance is to petition Google for an exception to the rule for religious organizations, but that’s not what we’re going to cover here today. The interesting thing about the two qualities that Google picked is neither of them are actual lifestyle choices. In fact, there are probably plenty of pastors in the US who are faithful, married with kids, but for whatever reason have attractions to the same gender. Are these pastors bad? No, they are living a faithful lifestyle despite their temptations. Similarly, there are probably pastors who for whatever reason suffer through questions about their gender. As long as they are clear that their true identity is in Jesus Christ, and they are going to fully accept who God made them, they are still living a biblical lifestyle. It is likely that even if your church bans certain lifestyles in their hiring process, they still are meeting the requirements of not discriminating on basis of orientation or identity because those aren’t lifestyles. Basis of is a distinct phrasing. The main definition of basis – the underlying support or foundation for an idea, argument, or process. We need to be clear on what your hiring process consists of. Do you list or evaluate sexual orientation or gender identity as the clear definition for your hiring decisions? As long as you’re seeking positive criteria like that, you will end up with a good fit for your organization who fits ALL of your standards. There is nothing about your hiring process that discriminates on the basis of sexual orientation or gender identity. This is as clear cut as it gets, most churches can honestly check the box and start filing for Google Ad Grant. Now, there is no guarantee that if a church checks those buttons Google will give them the ad grant. You need to be a 501(c)(3) and be listed on the publically searchable IRS database and then Google ultimately has the right to approve or deny anyone they want. Still, they have a really high approval rate! I will guide you through the process of filing for the ad grant, but I cannot help you establish a 501(c)(3), you should check with a lawyer on that subject. If your church is covered under a group exemption, you may want to file to be listed on the IRS database anyway to improve the likelihood of acceptance. Note that the average ad grant account only spends about 3% of their ad grant amount. They usually leave somewhere around $116,000 on the table because it is very difficult to use AdWords properly and you will get much more success hiring an expert to do it for you! I know how to effectively get your account spending much more than that, unless your surrounding area has very low population in which case we can team up to use your grant to share the gospel on a broader geographical scale if you wish. Even then, $10,000 a month in the hands of someone who optimizes all of the components of advertising is much more powerful than $10,000 willy-nilly. My personal pricing is that I charge a flat rate, $1,000 a month. However, I do not start charging until you are approved for the ad grant and have a month where the account spends $2,000. This insures that you are getting at least a 200% ROI, with the end goal being 1000% ROI on free ad spend alone, let alone the results that are worth far more than the ad spend. I’m doing this because I believe we can use this technique to reach people who would otherwise never see God’s Word or go to Church! Pray about it, and if you want your church to be a part of this mission and potentially grow a lot of in the process, request a call and I’ll be happy to talk with you.